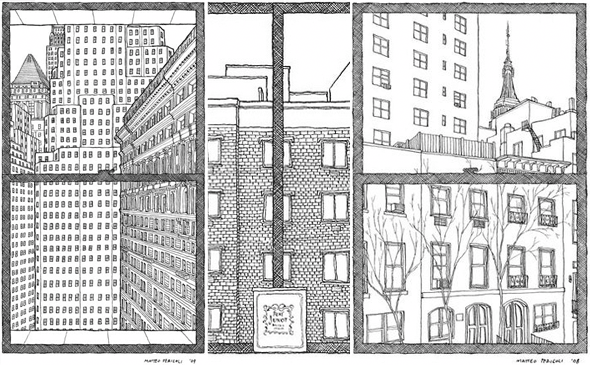 Thanks to the Guardian I’ve just learnt all about Matteo Pericoli, an Italian who moved to New York in 1996 and started doing beautiful line drawings as a hobby while he worked as an architect. This hobby evolved into something more serious, and now Pericoli has a series of books showing skylines around the world. His New York views from famous people’s windows are my favourite though, showing a range of vistas from traditional NYC landmarks, through water tower strewn rooftop landscapes to just the windows of the opposite building. Pericoli has even won acclaim for creating the cover art The Beastie Boys ‘To The 5 Boroughs ‘ album. Lovely, evocative stuff.